Red Herring Studios is an artists’ collective that has provided working space for an eclectic range of over 200 artists and craft makers in Brighton and Hove for over 30 years. It moved to its current location in 1999 and has become one of the longest residing tenants of the Westerman Complex industrial area in School Road, just off Portland Road, Hove. Red Herring is a membership organisation and is run by its members. The original limited company converted to a Special Industrial and Provident Society (a not-for-profit, charitable cooperative) in 1993. 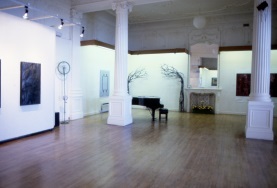 The organisation first set up studios in April 1985 in the old Paragon photographic laboratory – believed to be the first mail order photo processors in the country – in West Street, in the centre of Brighton. The subsequent conversion of a number of other elderly buildings around the city saw the continuation of its mission through changing times. 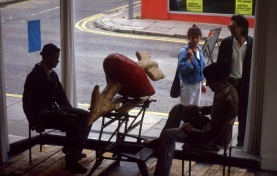 Whilst at West Street, Red Herring secured the temporary use of the redundant Bennett’s hardware store in North Road in the North Laine from the Avon Group for a temporary exhibition of installations called On All Fours in the 1986 Brighton Festival. By the end of that year, and with the cessation of their first tenancy, Red Herring agreed the rental of these extraordinary premises for studios. This Dickensian department store was a leaky Aladdin’s cave of surprises, incorporating shop fronts, a basement, an old cobbled alley way and several smokeries. When the licence on North Road ran out in 1990 Red Herring secured two thirds of the Wellesley House office block on Waterloo Place (that now houses Phoenix Arts Association) for studios. Grand Metropolitan, the then owners of Wellesley House were unfortunately intent on a major redevelopment scheme for the Phoenix Brewery site, which this block fronted, and insisted on the limits of the short lease agreed. 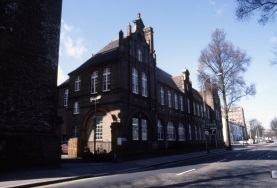 The next move, in 1991, was again to the beautiful old school building in Preston Road, next to the Lewes branch railway viaduct. This building had in recent years provided engineering facilities for Brighton Technical College but was in the process of being handed back to East Sussex Education when a change in government policy made it the property of the newly constituted, financial-legal entity that is now Brighton City College. The odd hiatus in use/ownership provided the window for occupancy as studios but sadly yet another short stay. 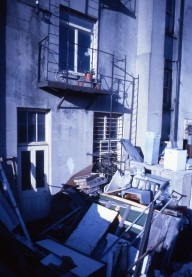 Departure from Preston Road in 1993 was to another fascinating suite of old properties in Gloucester Road, back in the middle of town, recently vacated before the end of their lease by Surridge Sawson, who had used them as a distribution depot. Unfortunately the owners would not agree a sub-let or new licence and the following move saw a departure from central Brighton. In the old Maynards sweet warehouse in Stoneham Road, Aldrington, Red Herring at last found a proper tenancy with a five year lease. 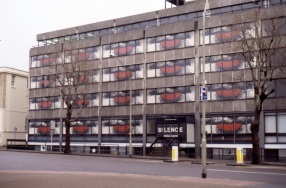 The size of this building meant that we were able to help out fellow artists’ group Maze who were finally being evicted from the Avon Group premises they had secured across the street from Bennetts in 1988, following Red Herring’s good example as artist tenants. At the end of the tenancy on the Stoneham Road building in late 1998 a negotiated extension fell through and after a short and damaging ‘in storage’ period of a few months a new short term home was found in the current premises around the corner in the Westerman Complex in School Road. Changing ownership, interesting neighbours and imminent redevelopment plans have enlivened the long occupancy at this venue and there has been a continually changing roll call of members through the doors. You can see a map of former Red Herring locations on Google Maps. The story of Red Herring began with the vision of providing working space and a community of interest for artists in Brighton. Once the original seven members (Lucy Byatt, Jane Fordham, Jonathan Gilhooly, Christopher McHugh, Jon Mills, David Parfitt and Jane Pitt) had come together to form a group, make a plan and (finally) agree a name, they found premises in the middle of Brighton in the old Paragon photographic works in West Street. Then through the grapevine they found enough new members to join the initiative, putting up enough funds through deposits (on their yet to be constructed studios) to secure the short term licence on the building, move in, clear out and set up. It was very hard work, carried out entirely through voluntary effort and with a miniscule budget, but gradually the derelict laboratory was turned into a series of 23 individual studio spaces... and a gallery. This large, square space, nearest the somewhat secretive entrance to the building was, after much discussion and debate kept in its charming state of dilapidated splendour/grunge (after all the building had apparently been a work house, in a previous incarnation). 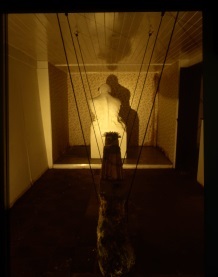 And so began a programme of self-curated/self-funded exhibitions including early solo shows by Bruce Williams (a member), Matthew Miller (a member of Bear Road/Aleph Studios) and Steve Geliot (a member of Cross Street craft studios). 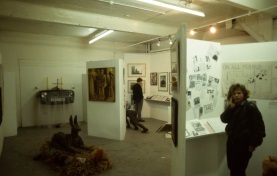 The polemical nature of this exhibition, highlighting the richness and range of what artists and crafts makers were doing in the town, led to collaboration with other artists and organisations such as Bright Red Theatre Company, Carousel, Zap, Open Studios, etc, in setting up Brighton Arts Forum. And from this initiative there followed a second installation exhibition in North Road, 14 Days at Bennetts, including Red Herring members and other artists based in the town. 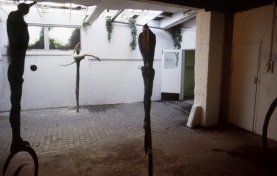 t the end of 1986, having to leave West Street, Red Herring moved into the old Bennetts building as a new studio base and set about turning the plate glass-windowed shop fronts, along with the basement beneath, into a new bigger suite of gallery spaces. This venue built a significant reputation over the next 3 years, housing an ambitious and varied programme of group, solo and project exhibitions including Between Dog and Wolf, The Box of Unearthly Delights, Travelogue, Chaos and Order, Hand to Hand, Between Men…. 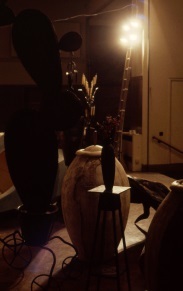 Some of these exhibitions were the ‘home-based’ aspect of high profile projects that reached beyond the confines of the gallery. 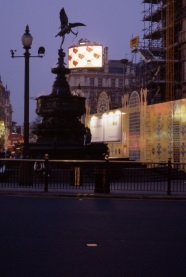 In 1987 Red Herring began curating a series of temporary public art projects that put new work into the public space for the duration of the Brighton Festival, starting with On the Scent - Beasts on the Streets and the Fleeting Monuments Scaffolding Art Project. In 1988 Travelogue saw work sited not only on the streets but in a multi-story car park, on the seafront esplanade and the beach and in Brighton and Victoria stations and in 1989 Chaos and Order continued the tradition. 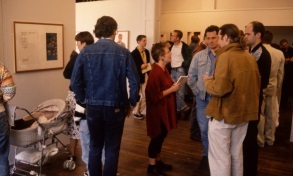 In 1990 the Festival asked Red Herring to curate a series of international projects including Crossing Over, an exhibition of installations from Poznan, Zagreb and Brighton together with selected work from around the region in the vast Corn Exchange venue, and Hand to Hand, a print/text project about AIDS and HIV made as an exchange between Red Herring members and artist from Brno. 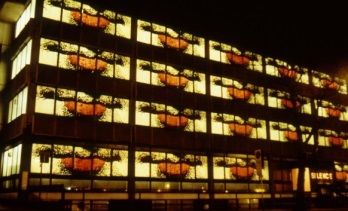 Later in 1990 Red Herring had to move home again and secured a short let on the larger part of the 1960s office block on Waterloo Place opposite St Peter’s church. The large, upper ground floor area with windows overlooking the Level became the new gallery, again scheduling a number of high profile exhibitions and projects and at the end of the year an in-house public art collective known as Artonic, turned the building into an anti-war comment with Read My Lips, converting all the windows into backlit projections of Warhol-style painted version of Julius Caesar’s mouth.